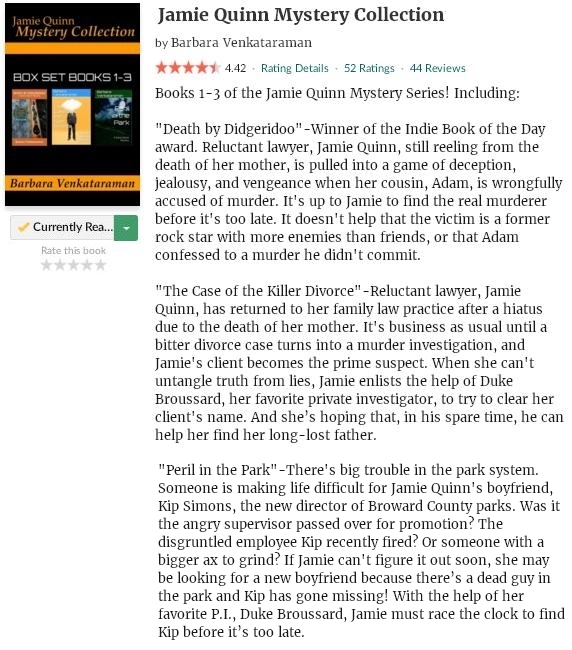 I’m currently reading the Jamie Quinn Mystery Collection by Barbara Venkataraman. It’s a box set of three cozy mystery stories and so far it’s without doubt an entertaining read. Hopefully I can find time later today so I can finish it. This entry was posted in Book Memes, Teaser Tuesdays and tagged barbara venkataraman, book memes, death by didgeridoo, jamie quinn mystery collection, peril in the park, teaser tuesdays, the case of the killer divorce by Yvo. Bookmark the permalink. So, reading Broken Monsters, I think I need one straightforward mystery novel before I plow once more in cuckoo land. Are you enjoying these so far? I feel like you read a lot of great mystery/thrillers. I’ve added a bunch to my TBR from your teasers! They’re definitely easy, fun and entertaining cozy mysteries; I kind of wish I would have saved them for my holidays because they are perfect vacation reads. This sounds like a great series that I’d enjoy. Thanks for introducing me to this author.